Now on day three of our volunteer blogs, I caught up with Support Volunteers, Emma and Eleanor, who help to supervise the Student Action Volunteers of a Wednesday afternoon, to find out how they feel about volunteering at St Nicks. Emma: I am a support volunteer for the Student Action Volunteering sessions which take place every Wednesday during University term time. Recently I have been helping Eithne who runs the sessions by being available for the volunteers to ask questions about the activities we are doing, or if the group is large by leading small groups in tasks around St Nicks. Eleanor: I am also one of the volunteer supervisors for the Student Action Volunteers. 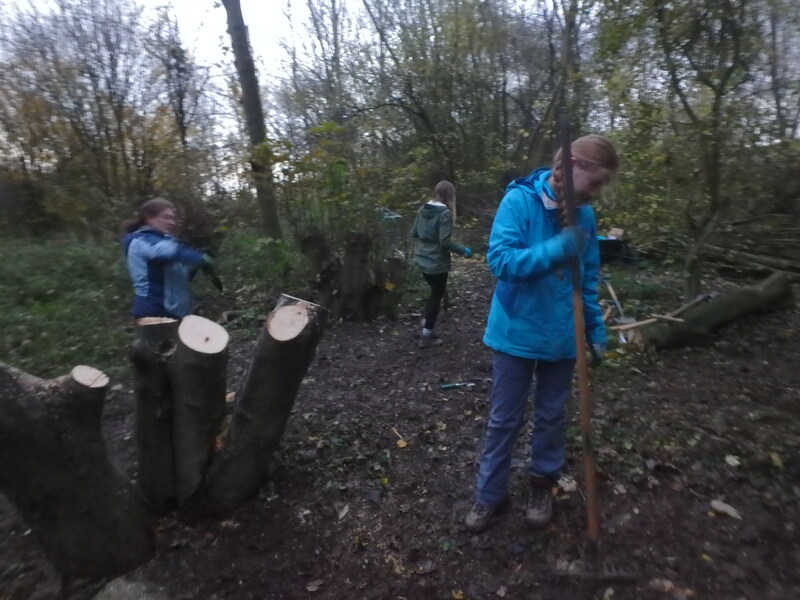 We undertake various tasks around the reserve, depending on the time of year or what needs doing. 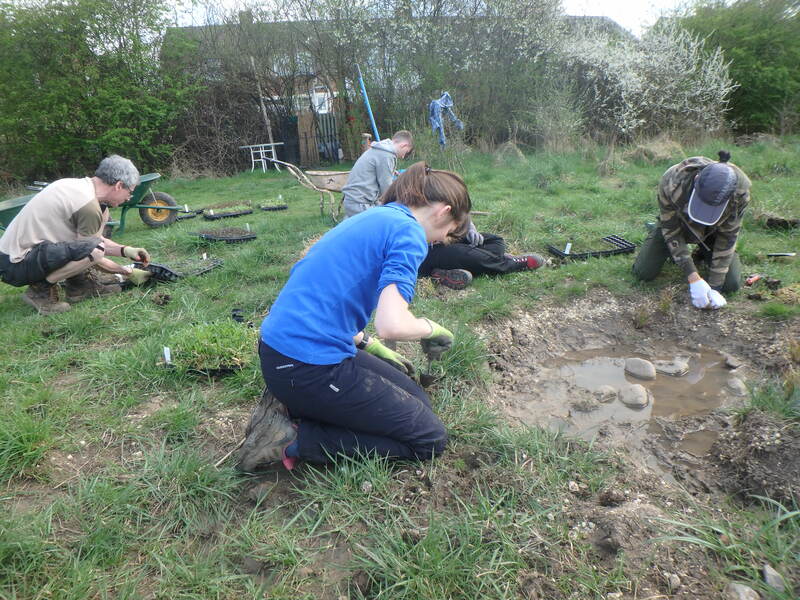 We have been involved in landscaping (digging a scrape and making a bee bank), working on the meadow, planting seeds and plug-plants, and clearing scrub. The role of supervisor involves helping the other students complete the tasks, sometimes leading a small group of students in a task, and answering any questions they may have. Emma: Being able to spend a few hours outdoors in nature has become really important to me and I genuinely think it’s one of the main things that keeps me stable and happy during stressful studying periods at uni! Eleanor: I volunteer because I want to offer my time to good causes and do things that are different from academic study. It gives me a chance to learn new things, meet new people, and just get out of the university ‘bubble’ to help the community. I like that volunteering is flexible, so if I sometimes need to prioritise my study over volunteering, I am allowed to do so, which would likely not be the case for a part-time job. I also like to know that I am using my time for useful activities, getting outside, and helping people. Emma: Yes I love volunteering at St Nicks. From my first session, every person I have met has been so welcoming and friendly- there’s an amazing community spirit. Eleanor: Yes – definitely!! I love being able to get outside and into nature every week, even if the weather can be challenging sometimes! Getting fresh air and working outdoors really helps my mood, especially when I’m stressed with university work! I also love the environment at St Nicks – the reserve is beautiful, but also the community of people who work there, or pass through, are all lovely, kind, and supportive. Eleanor: So much!! I have learnt an awful lot about nature conservation, management, and surveying. Without volunteering how would I know that you could make rafts for water voles in order to see whether they’re present in an area?! I’ve also learnt lots about different species, particularly plants, and it’s brilliant to be able to talk to other volunteers who often know some really interesting things about the natural world. Emma: I learn so so much every week! Before volunteering although I enjoyed being out in nature I was very clueless about all the native wildlife we have in the UK and it’s great to learn about different species and the ways to conserve them each session. Emma: My highlight so far is a bit ongoing as it’s been great to watch an area we worked on last year by digging scrapes for wetland species develop over time. We’ve started spotting some of the plants we put in last year popping up around the reserve and it’s lovely to see that they’ve not only survived but some, such as the ragged robin, are thriving. Eleanor: I wouldn’t say I have a single specific highlight of volunteering, as every week I can leave feeling proud of what we have accomplished. 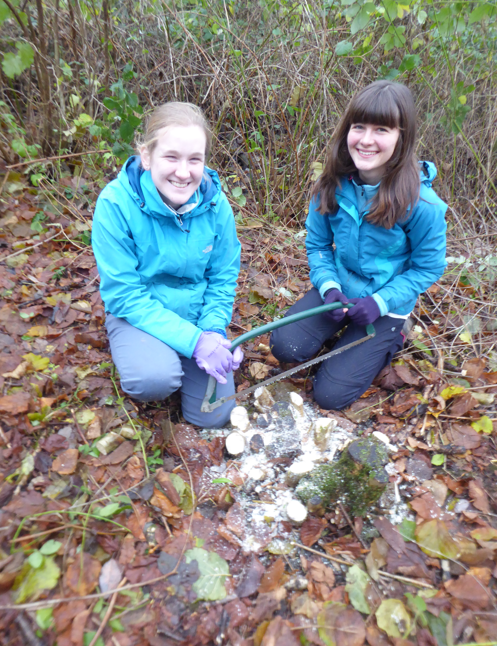 However, I do absolutely love seeing how things we have worked on as volunteers evolve over the seasons and years. You can see flowers blooming and think ‘we planted them!’, or see the meadow become stunning in the summer and think ‘we helped spread seeds on that, and helped remove the grass!’. Seeing what we have done come to life in front of you is really something. Eleanor: St Nicks is a beautiful nature reserve, with a friendly community, just outside the walls of York City Centre. It’s a hidden gem of forests and meadows in the middle of York that is lovely to work in or simply wander through. It changes through every season, and is a remarkable showcase of how nature can recover after human environmental impacts (as the reserve was once a landfill site). 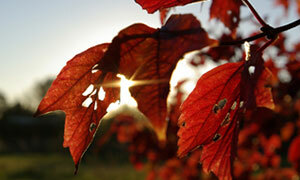 Emma: A beautiful nature reserve that changes immensely season to season but is always a joy to visit. You feel instantly welcomed by the amazing people who work and volunteer there and get to experience a great connection to nature right in the centre of York. If you’re currently studying at university and would like to join the Student Action Volunteering or if you are just someone who would like to contribute to improving a local green space, get in touch to find out more about how you can volunteer at St Nicks by emailing volunteer@stnicks.org.uk.